Once upon a time infrared was regarded as being the new astronomy. There was even a book of that title, published in 1975 and written by David A Allen. By 2014, and David L Clements' book Infrared Astronomy - Seeing the Heat, infrared was dominating the field. No longer the new astronomy, now it is astronomy. As the BBC news web site pointed out, last week marked two years until the launch of the James Webb Space Telescope (JWST). This is the replacement for Hubble, and is a much more powerful/sensitive device. 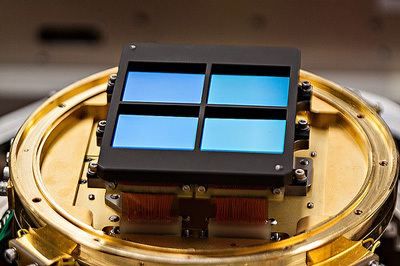 The mirrors and optical components are now assembled and ready to be tested. It's a reflector. Radiation hits the main mirror, 6.5 metres across, is then reflected and focussed onto a much smaller secondary mirror in front of the main one and then reflected onto sensors at the centre of the main mirror. You can see this in the photo above. This is one of its sensors, for NIRCam - 2048 by 2048 pixels for near infrared wavelengths between 0.6 and 5 microns (600 and 5000 µm). NIRCam is one of four instruments: NIRCam, NIRSpec, NIRSS and MIRI. MIRI images wavelengths between 5 and 28.5 microns with a resolution of 1024 by 1024 pixels. This is a gross oversimplification, and sections 20 to 23 of Nasa'a scientific FAQ give much more information about the cameras. If you're interested in more fine detail about the NIR system, then try this NIRCam Instrument Overview paper from the University of Arizona. 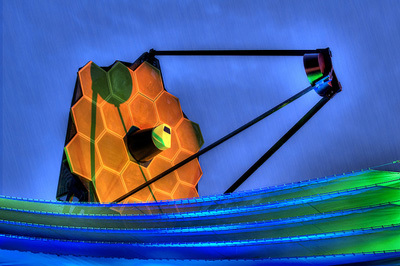 Nasa has a set of web pages, Explore the James Webb Space Telescope, with copious resources.